The poles are fascinating, partly because they are such difficult places to visit, work and live. They still guard many mysteries that we’d like to unravel, including the survival of polar animals, the history of ancient peoples, and the understanding of Earth’s climate. 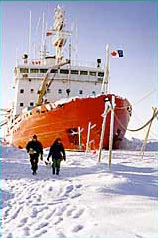 Two biologists walk from the icebreaker Des Groseilliers toward their lab. Scientists work in more than a dozen huts and tents on the ice. Following carefully laid plans, the icebreaker was frozen into place in the Arctic Ocean, and left there for a year. Why is computer modeling important for climate change predictions? What unique contribution did SHEBA make to global climate change models? Why are Weddell seals a particularly useful animal for studying what goes on below Antarctic ice? How did the ancient land bridge between present-day Alaska and Russia — which allowed humans to cross from Asia to North America — form? How does radiocarbon dating work? What property of atoms does this technique capitalize on? Where did Arctic people find metal? How did they work the metal into useful implements? How does the discovery of artifacts like metal implements shed light on ancient social interactions? Let’s date (using radiocarbon techniques, of course)! In this trilogy of activities, students learn about isotopes, the half-life of unstable nuclei, and finally radiocarbon dating. Recommended for grades 9-12. Data mine! At this website, students explore climate research, both how it’s done and the data itself. Recommended for grades 9-12. Climate Models! Learn about climate change models in this NASA-approved lesson plan. Recommended for grades 5-8.